SOLID SHINE™ Series projectors use the newly developed LED/Laser-combined light source, and delivers next-generation reliability and flexibility. SOLID SHINE Series projectors provide both solid reliability and long lasting brightness unprecedented by conventional lamp-based projectors. No need to replace the light source or air filter, providing a dramatic reduction in TCO. Excellent picture quality and brightness are maintained for a long time. Beautiful, vivid colours exceeding the levels of conventional projectors. can be turned on/off as many times as you want. This new light source requires no maintenance for approximately 20,000 hours. * In many cases, this means no maintenance until your next refresh cycle. 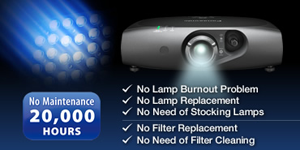 Naturally, there are no lamp burnout problems during use, so reliability is further increased. There is also no filter to clean due to carefully engineered sealed optics. The PT-RZ470/RW430 features 3,500 lumens Contrast is outstanding too, at 20,000:1, and images are reproduced with a wide dynamic range. The PT-RZ470 also features a Full-HD (1,920 x 1,080) DLP™ chip, allowing highly detailed Full-HD images without resizing.of brightness. Rate of brightness deterioration in the LED/Laser-combined light source is extremely slow compared to lamp-based projectors. The SOLID SHINE drive uses a built-in sensor to constantly detect the light intensity of the light source and correct corresponding changes in white balance. This all helps to maintain excellent picture quality for a long period of time. Contrast is outstanding too, at 20,000:1, and images are reproduced with a wide dynamic range. The PT-RZ470 also features a Full-HD (1,920 x 1,080) DLP™ chip, allowing highly detailed Full-HD images without resizing. The LED/Laser-combined light source has a higher level of colour purity than an ordinary lamp, allowing it to achieve colour reproduction with wider colour space. 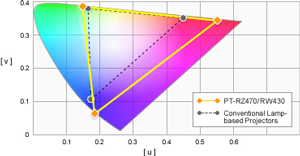 Colours are more vibrant than those of conventional projectors. The new LED/Laser-combined light source in the SOLID SHINE Series projectors provides approximately 20,000 hours* of operation with no lamp or filter replacement needed. This dramatically lowers maintenance costs and labor. A highly durable system has been achieved with an originally designed, efficient cooling system for the new light source, and a dust-proof structure. You get stable operation and solid reliability for a long period of time. System capabilities such as a 2x zoom lens, an exceptionally wide lens shift range, and 360-degree installation support highly flexible installation. DIGITAL LINK also enables long-distance digital transmission with a single cable. Images do not appear quickly with lamp-based projectors because the projector requires time to warm up. With the PT-RZ470/RW430, the image appears almost instantly. There’s also no cooling time required when turning the power off, so you can quickly turn the projector on and off as many times as needed. Ordinary lamps are not well suited to continuous operation. 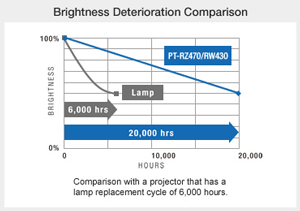 Because the PT-RZ470/RW430 does not use a lamp, has efficient cooling system and uses DLP™ chip that has a long life, they are capable of 24/7 operation. To discover more functions such as Multi-screen projection with edge blending, portrait mode, 3D projection or Digital Link please visit the product pages of PT-RZ470E, PT-RW430E, PT-RZ370E and PT-RW330.